Do You need to TAME YOUR TONGUE? This FREE resource provides a guide to praying the Fruit of the Spirit over the words of your mouth. Each page features a Bible verse, short prayer and journal space for your own personal reflections. You will receive a 10-page prayer guide and journal. How would LOVE change your language? The fruit of the spirit in our lives empowers us to live like Christ and to talk like him, too! Just think how different your tongue would be if it were characterized by the fruit of the spirit! 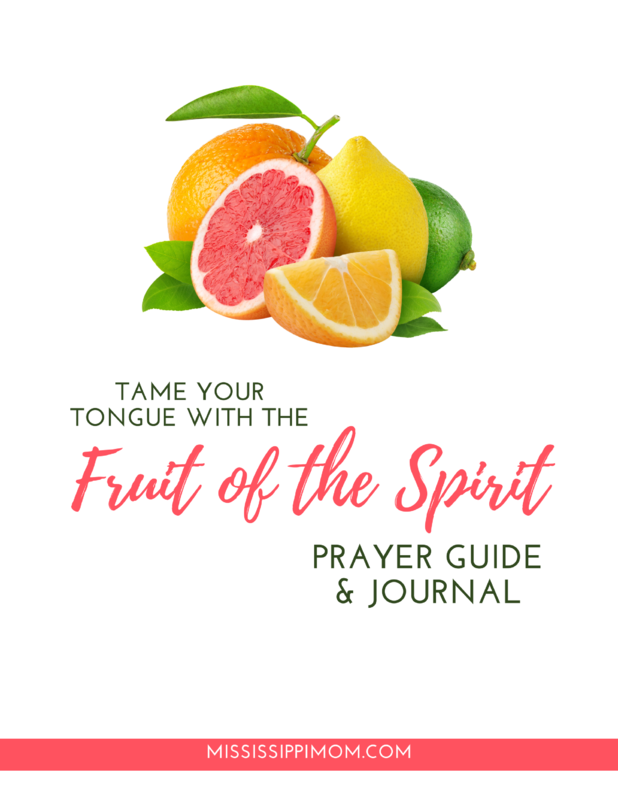 Use this simple prayer guide and journal to pray the fruit of the spirit over your words and watch the impact it will have. Get Your FREE Prayer Guide Here! Get Your FREE Prayer Guide! Signup to receive your FREE prayer guide and journal, as well as other resources available ONLY to subscribers! Send my FREE prayer guide & journal! Your free prayer guide and journal is on its way! You'll also be receiving future emails from MississippiMom.com that will contain resources to help you grow in your faith and encourage your family.